Salt Lake City, UT – When the makers of Hydro Flask approached us with the claim that their insulated bottle would keep hot beverages hot for 12 hours and cold drinks cold for 24 hours, we were skeptical. After all, what would make this bottle any more attractive than a run of the mill stainless vacuum bottle? It’s a good thing that we can admit when we’re wrong. We filled our sample 21 oz. Hydro Flask ($25.99) with hot chocolate and tossed it in a backpack on a minus 12ºF day. Hours later, we pulled the bottle from the pack fully expecting to be forcing down lukewarm chocolate water. Much to our surprise the cocoa was still burning hot. The Standard Mouth bottle from Hydro Flask. These double wall insulated bottles are constructed of 18/8 stainless steel, finished with an assortment of attractive patterns. The pebble finish red bottle we tested was easily gripped while wearing ski gloves. The larger than normal 1-3/4 inch mouth allows for the addition of ice cubes or tea bags and helps to avoid spillage when clumsy folks like us fill the bottle. The double wall also keeps the bottle from sweating under the hot summer sun. As a result, as of press time these bottles are on a 10-day backorder if purchased directly from the manufacturer. They may also be found, however, at retailers nationwide. About the only thing we missed from a standard vacuum bottle was the built-in cup, but we sure appreciated the bottle’s ability to keep beverages hot in a frigid environment. 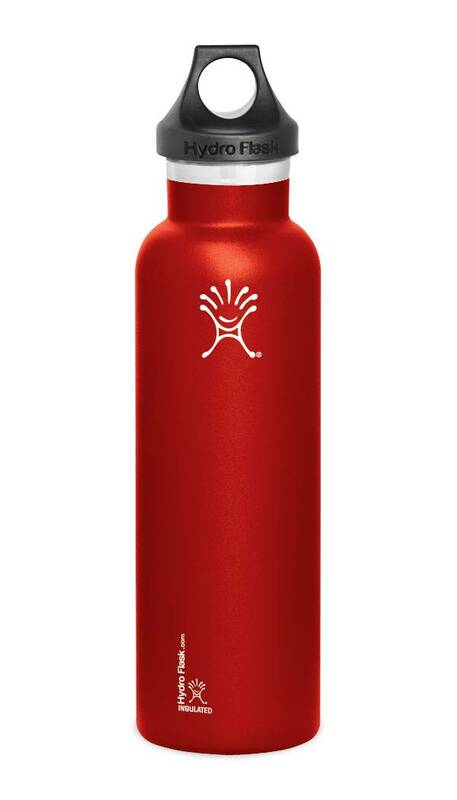 The Hydro Flask comes with a lifetime warranty, and through fivepercentback.org the company donates 5% of gross profit back to a nonprofit organization of the buyer’s choice.